During winter snow-topped hills rise above the Chilao Visitor Center's boardwalks and viewing decks. Background: This wooded valley dominated by pines sustains more than 100 bird species. In 15 minutes you can count two dozen species from the observation deck! It is known internationally for its reliable year-round views of mountain quail. Other residents include California quail, acorn woodpeckers, white-headed woodpeckers, and white-breasted nuthatches. Patient observers may see Anna's, Allen's and rufous sided hummingbirds from March to September, a dry period when numerous animals visit the center's watering pan. 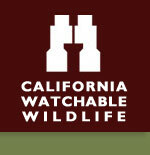 The brushy chaparral is home to California thrashers, Merriam's chipmunks, and alligator and western fence lizards. Seasonal Chilao Creek shelters warblers, wrens, American bushtits, mule deer and coyotes. The Habitat: Spectacular peaks and deep canyons surround this area. Viewing Tips: Excellent year-round birding. Four self-guiding trails; naturalist programs. Site Notes: Once you visit this beautiful site, you'll understand why it was chosen years ago as the summer home of the Gabrielino Native Americans. With enough advance notice, the visitor center also gives tours to visitors and school groups seven days a week. Festivals & Events: Bird walks on the second Sunday of each month between April and November and a native plant walk on the 3rd Saturday of the month between April and October. Seasonal: As long as road conditions allow. Open/close status in the winter will change due to road and/or weather conditions. Parking Notes: The center can accommodate large buses and RVs. Special Tips: Chilao Campground 5,300-foot elevation. 84 campsites. Some of the toilets are accessible for visitors with disabilities. Maximum RV length 40 feet. No Hookups. Be Aware of Bear Activity. Sites are $12/night. Campsites are first come - first served. How to Get There: From Los Angeles, drive north on Highway 2 (Glendale Feeway). Turn right (east) on Interstate 210. Take Highway 2 (Angeles Crest Highway) exit. Turn left at light and drive 27 miles. Turn left; drive 200 yards to entrance.